One of my favorite baking activities is making a pie for my family. It enhances my kitchen with the sweet smell of fruit and crust. It’s guaranteed to put a big smile on everyone’s face. This recipe is very easy. Try it! Be sure to have vanilla ice-cream on hand. Cut about seven peaches into 1/4 inch slices. Next, slice about 10 ruby-red strawberries in half. Get a bowl and add 1/3 a cup of flour. Add 3/4 a cup of sugar, a pinch on cinnamon, a dash of vanilla and 1/4 cup of butter. Mix them together until the mixture is crumbly. 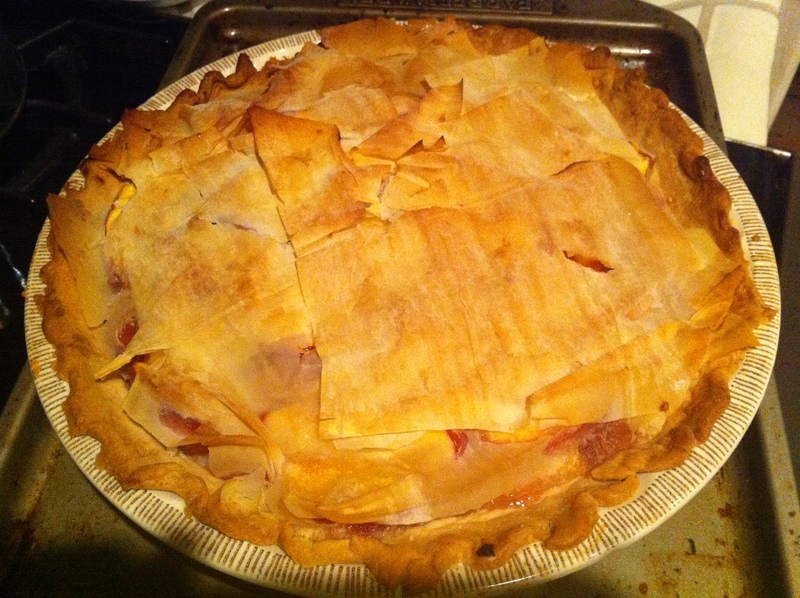 Place a layer of peaches and strawberries on top of the pie crust. Next, layer the crumbly mixture on top of the fruit. Repeat until both the fruit and mixture are all in the pie dish. I layered three times. Bake at 350 degrees for 45 minutes. It tastes divine with ice-cream of fresh whipping cream. Enjoy!